In the last 2 posts, I shared some practical ideas about how to engage with culture authentically and how to support the local economy when traveling. The last element of responsible travel is the one most people think of when they hear sustainable tourism or responsible travel–protecting the environment. Some people criticize “green travel” because they say unless you’re walking, biking, or driving an eco-friendly vehicle, you’re still usually using a hefty amount of fuel to get to your destination. It’s true, friends. Travelers also waste a lot–water, plastic, fancy little toiletry bottles. And what about all that exploiting nature–ruining coral reefs, sedating animals so they’ll pose for pictures? Tourist hot spots are not always kind to nature. Maybe you’ll all go out and start living off the grid with zero waste and become completely self-sustaining and never fly in a plane ever again…Some people might jump in with something huge like that, but I’m guessing that most of us will try to find ways to incorporate change into our everyday lives. This list doesn’t cover everything, but these green travel tips are a simple starting point for all of us to incorporate more sustainability into our travels. Look into alternatives to car rentals. In a lot of places, public transportation is the daily way of life for locals. Bus routes are extensive in a lot of Latin American cities, and traveling this way is a great way to get a feel for everyday life in the country. 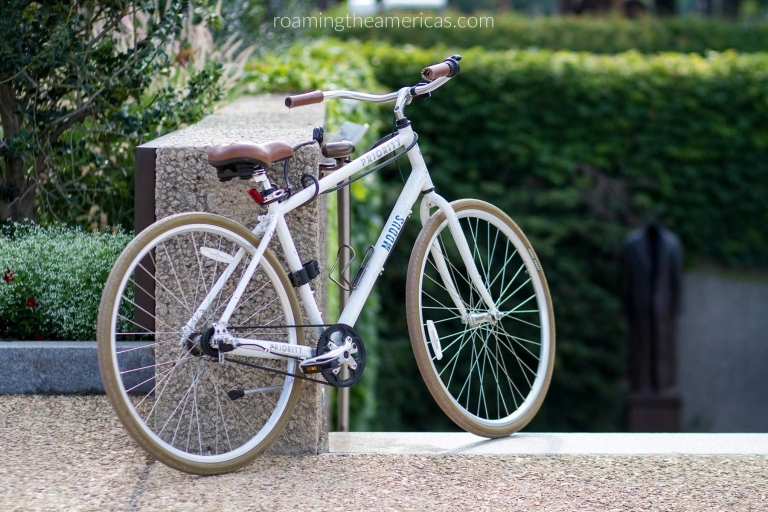 Another option is biking–lots of U.S. cities have built bike paths and have bike rental programs that make it easy to see the city from a slower, ground-level perspective. When I was living in Costa Rica, I took several buses every day, and this became one of my favorite parts of the day. I also took a regional bus several hours away for a weekend beach trip, and it made life so much simpler to not have to worry about directions or breaking down, or worse–getting in an accident in a foreign country. In many U.S. cities, you can find buses, subways, and regional trains to get you around (not to mention saving on city parking). QUICK TIPS: Don’t be afraid to ask a local. Even in the “unfriendly, fast-paced” Northeast U.S., I’ve found most people to be helpful. In developing countries, realize that there might not be route maps or schedules, so enlisting the help of a local is important. Also, read up on the safety of bus routes and ask a local. I’d feel comfortable using public transportation in Costa Rica or Cuba, but I’d avoid certain routes in Guatemala due to frequent hijackings and accidents. Take a reusable water bottle instead of buying plastic. This one 1-week trip is no biggie, right? That’s what I’ve always thought, especially when traveling in areas without safe drinking water. So I’ve usually done what most people do–buy bottled water during my trip. Without throwing too many numbers at you (take a peek at The Water Project for a few stats if you’re curious), bottled water requires a lot of energy and fuel to produce, and most of the bottles end up in landfills. Do a quick Google Image search of “environmental impact of bottled water,” and you’ll see the sum of all of our daily choices. It’s shocking and disheartening. Reusable water bottles are a pretty easy way for us to use less plastic and make a dent in all this waste, whether at home or while traveling. SAFE DRINKING WATER: If you’re traveling somewhere with safe drinking water, a simple stainless steel bottle like Healthy Human is a great option. As a bonus, it keeps your water cold all day, which is so refreshing on a hot day! UNSAFE DRINKING WATER: If you’re traveling somewhere with unsafe drinking water, you can look into water purification (not simply water filtration). Two popular options are Grayl and Lifestraw (I’m hoping to do some reviews on my next international trip, so feel free to let me know your suggestions in the comments below). Check out this post about drinking water safety for more info, and make sure to do plenty of your own research before using these water bottles in a country with unsafe drinking water. Tourists use anywhere from two to ten times the amount of water that locals do (see this PDF fact sheet from responsibletravel.org), but there are a few simple things we can do to reduce that usage. When I was studying in Costa Rica, I lived with a middle-class family, and they were very economical and conscious of saving energy and water. I quickly learned that long showers were not an option when my host sister banged on the bathroom door one morning and yelled, “Noemí, you’re taking a long time!” The daily norm? Using water only to rinse off. I would turn it on briefly, turn it off to shampoo my hair, turn it back on to rinse, and repeat the process several times. Many hotels now have signs letting you know that in order to reduce water usage, the cleaning staff will leave any towels that are hanging up so that you can reuse them throughout your stay. If your towel is on the floor, they’ll remove it to wash and replace it with a fresh towel. Take the simple step of reusing your towels throughout your stay to cut back on water usage in your hotel room. Buy reusable travel-sized toiletry bottles. All those little bottles they give you at hotels are adorably irresistible, and convenient…I feel you. But again, with the landfills. A really simple and quick solution is to purchase the carry-on-sized bottles that you can label and reuse over and over for everything from shampoo to soap to sunscreen or other creams or liquids. These are just a few simple green travel tips. What would you add to the list?